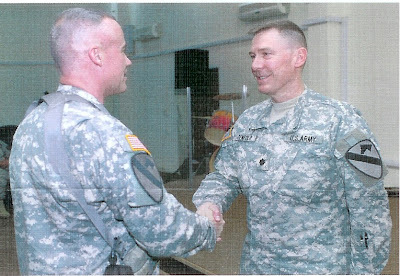 Grace Brethren military chaplain Mark Penfold (at right in photo) was recently promoted to Lieutenant Colonel while deployed with the First Cavalry Division in Iraq, according to the latest newsletter from The Eagle Commission. The Eagle Commission, which works with Chaplain’s Endorsing Agent John Schumacher, is directed by Dr. Larry Chamberlain of the Grace Brethren Investment Foundation. For more information contact The Eagle Commission at P.O. Box 587, Winona Lake, IN 46590 or call (574) 267-5161.